November 19, 2013, 9:34 a.m. The devastating typhoon Haiyan has coincided with the 2013 United Nations Climate Change Conference in Warsaw, creating a stark backdrop for political negotiations on climate change. The Filipino government has firmly linked the typhoon to man-made climate change and urged delegates to resolve the currently deadlocked talks in Warsaw. 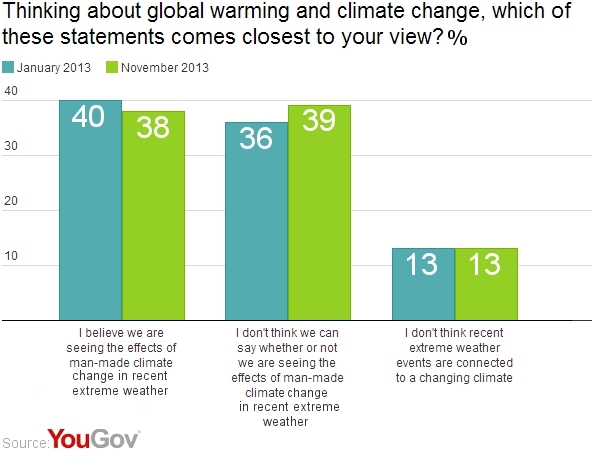 Following extreme weather conditions in January research conducted by YouGov asked the public if they attributed the recent weather to man-made climate change or not, and found people roughly equally divided on the issue. In the wake of the recent typhoon in The Philippines the public remain as divided as ever. 38% believe we are seeing the effects of man-made climate change, 39% feel that that it is too soon to say and a further 13% believe that recent extreme weather events are not connected to a changing climate. There remains a political divide in opinion, with Labour (50%) and Liberal Democrat voters (47%) around twice as likely to think we are witnessing the effects of man-made climate change as Conservative (27%) or UKIP (25%) voters. Filipino delegate Naderev Sano, whose family were affected by the typhoon has gone on hunger strike until “meaningful progress” is made.